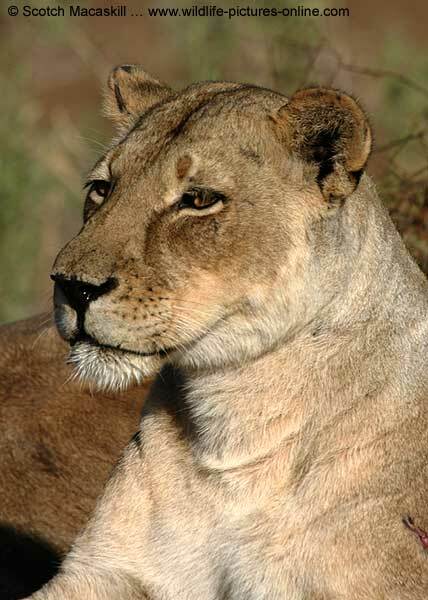 Caption: Close-up of Lioness (Panthera leo) as she scans the horizon, Mashatu Game Reserve, Botswana. Photo: © Scotch Macaskill. Camera: The photograph was taken with a Canon EOS 350D digital SLR camera and Canon EF 100-400mm f/4.5-5.6L IS zoom lens. Exposure: 1/800 sec at f/8; ISO: 200; Lens focal length: 400mm. Location: Mashatu Game Reserve is a 26,000-hectare (64,000-acre) reserve situated in the remote eastern corner of Botswana.